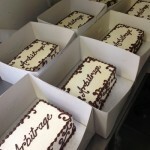 The team at Cakes by Robin were extremely excited when we were recently given the exciting opportunity to bake some promotional cakes for new film Arbitrage. Looks like they went down a treat! Cakes are a brilliant way to promote your product, whether it’s the next blockbuster or the opening of your new shop. Everyone will want a piece, meaning your product gets exposed to a much bigger audience. You might be able to reach people who might otherwise turn down a dull leaflet, because after all, who can turn down cake?! It can be boxed up and sent out to all your most important clients who will appreciate the little treat and will be able to find out more about what you’re promoting in the process. Cakes by Robin are able to create promotional and corporate cakes in all shapes, sizes, colours and flavours to create an absolutely exquisite and unique promotional material for your company. 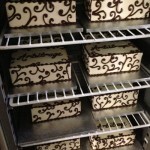 Not only will it look great, it will also taste fantastic. And what else will cause a stir quite like a delicious slice of cake?